What is the Economy? What is it for? How Does it Work? Instead of a plane taking off, we need a kite-surfer. This was one of the memorable images used by Kate Raworth in a presentation full of passion, humour and clarity of expression, but without the derision and scorn which so often accompanies or even replaces critique. Current economic thinking, and therefore teaching, is based on theories from the 1950s and much earlier. In a world weary of the privations endured throughout 6 long years of war, there was a huge public appetite for a more comfortable material lifestyle. We must also remember that the total world population in 1955 was just 2.8 billion. Today, it is 7.6 billion. Despite a measurable slowing of population growth, it is likely to reach 10 billion in 2050. The needs of such a vastly increased human population cannot be adequately met by the continuation of the 20th century economic model. Kate Raworth reminded us of this more than once. Models which show only the flow of money are dangerously oversimplified. By leaving out the living world, energy, materials, work, and the commons, these models only tell one aspect of the multifaceted economic story. What better place to present this than the London School of Economics, and to an audience the majority of whom were studying, or had studied, economics. Kate took us through the stages in the development of an economic mindset that fails to take into account the most pressing issues we face today. We saw how several of the economists who contributed to this process had acknowledged that their model was incomplete or imperfect, but how all these caveats were swept aside in the rush to create a simple, scientific model. The aim of 21st Century economics is this: to meet the needs of all within the limits of the planet. Kate’s use of pictures and analogies, of which the doughnut is but one, made this a lively and accessible presentation. The plane I referred to at the beginning is the exponential growth curve seen so often in mainstream economics. It makes no sense – nowhere in nature does anything grow exponentially and continue to do so. Instead we need to accept that to achieve the above aim we must overcome our addiction to growth, give up flying (and who would want to fly in a plane that never levels off, let alone lands?) and take up something like kite surfing, ever responsive to the winds above and the waves beneath. 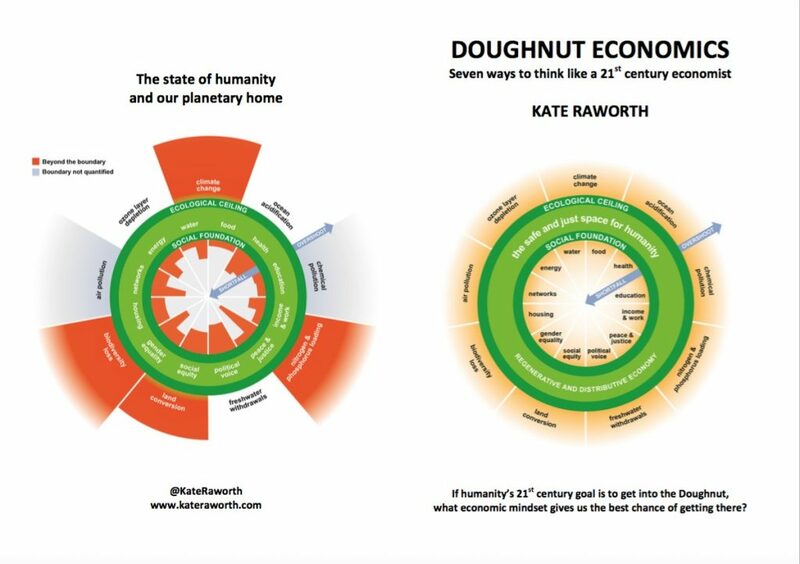 Doughnut Economics resonates perfectly with Transition, especially with the ReConomy project. We need to create new ways of meeting our needs that bring back the role of the household and the commons. These have been pushed aside by the market that has been idolised for so long. Local currencies, co-operatives, new business models. It’s happening! The list is long and growing longer by the day. The increasing popularity of reusing, upcycling and recycling. Swishing. Repair Cafés. Restart workshops. Restaurants and other food outlets proudly advertising their business links with local growers and brewers. The redistribution of out-of-date food, reducing waste and hunger at a stroke. 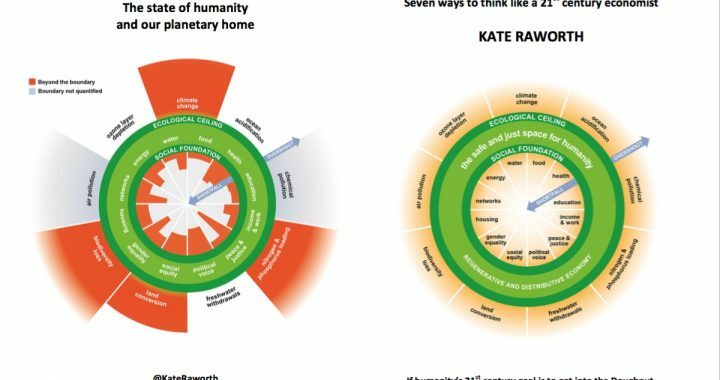 All of these and more represent significant steps in the direction of a circular economy, although Kate also indicated the need for legislation, for example, to reduce the use of plastics. And as Kate pointed out, technology is on our side, with instant communication and open source. We need to help her spread these ideas far and wide, and fast, being mindful of the effectiveness of her robust use of humour and upbeat delivery of an often unpalatable message. (1) The environmental ceiling consists of nine planetary boundaries, as set out by Rockstrom et al, beyond which lie unacceptable environmental degradation and potential tipping points in Earth systems. The twelve dimensions of the social foundation are derived from internationally agreed minimum social standards, as identified by the world’s governments in the Sustainable Development Goals in 2015. Between social and planetary boundaries lies an environmentally safe and socially just space in which humanity can thrive.